Though StartX is financially and legally separate from the University, it works in partnership with Stanford Student Enterprises (SSE) and was initially named SSE Labs. The majority of StartX’s 31 full-time and support-staff members are Stanford students, and over six percent of Stanford students apply to StartX every year. The majority of the presenting startups were members of the accelerator’s most recent class, though several alumni startups returned to Demo Day for additional fundraising. Presenting companies represented a wide variety of industries including medical technology, educational technology, consumer Internet, biological technology and enterprise. Many StartX founders connect with funding sources through Demo Days, where founders give short pitches and interact with investors. According to Alexa Lee ‘95, director of PR and communications at StartX, investors from Silicon Valley to New York travel to the three Demo Days hosted each year. Lawrence Udell, founder of the Silicon Valley Chapter of the Licensing Executives Society, is one such investor. Udell said that he has attended every StartX Demo Day in hopes of finding new companies to invest in. Smita Saxena M.S. ‘10 first attracted the attention of investors after going through the StartX program with Accevia, a financial services company that was acquired by its first client in early 2011. Saxena pitched her second company, SpotOn, to investors at the most recent Demo Day. SpotOn is a time-based search engine that takes information about a user’s schedule, personality, location, budget, interests and relationship status to generate a list of activities that he or she might be interested in. 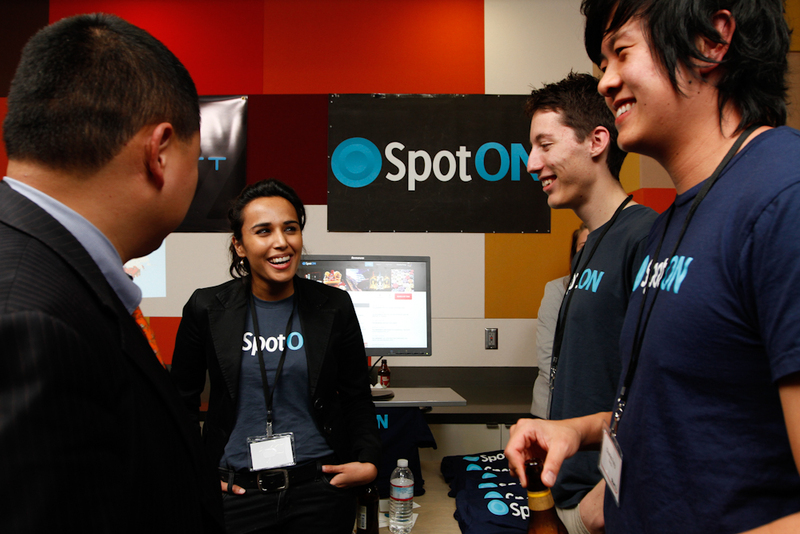 According to Saxena, SpotOn’s technology could be coming to Stanford students soon, as the company is collaborating with Stanford Athletics to integrate sporting events into student calendars. Lee said that investors are attracted to StartX because of Stanford’s reputation for producing talented entrepreneurs such as Saxena. The level of talent in the StartX pool also attracts mentors like John Baer, the founder of Threshold Ventures, who said that his work with StartX companies was a natural extension of his work as a venture capitalist. Baer most recently mentored Insynctive, an HR Service Delivery Platform co-founded by Eric Kish GSB ‘12. “I think they have found a really neat market niche and are targeting customers and doing a great job,” Baer said about Insynctive. LinkedIn co-founder Konstantin Guericke ‘90 M.S. ‘91 was also drawn to the StartX program as a mentor. Guericke works in the School of Engineering as an industry mentor and learned about the program from a group of students who were in the first StartX class. He most recently mentored Meet Mikey, a startup focused on making email more efficient. Guernicke noted that the quality of startups in the program has improved during his years as a mentor, while StartX has become more recognized and highly regarded on campus. According to Guernicke, the program has drawn older participants in recent years, which helped the program expand to a wider range of entrepreneurial challenges. Several companies that presented at the Demo Day have already proved their influence beyond the student population and found commercial success through partnerships with established organizations. Kyle Wong ‘12, founder of Pixlee, a platform that helps companies develop marketing using authentic customer photos, said that the San Francisco 49ers worked with Pixlee throughout the entire football season. Most notably, the 49ers used Pixlee to “rally fans for the Super Bowl” by allowing them to submit fan pictures. The project received 72 million submissions. Wong participated in the spring 2012 session of StartX. Since then, Pixlee has worked with Yamaha, Major League Soccer, Whole Foods, NASCAR and approximately one third of NBA franchises. Wong credited some of this success to connections he formed at Stanford. Dylan Arena ‘01 M.A. ‘01 M.S. ‘12 Ph.D. ‘12 also went through StartX’s spring 2012 program with his company, Kidaptive. Kidaptive received its first round of funding after presenting at the spring Demo Day and returned to the winter 2013 Demo Day looking for more financing to build out the rest of its first project. Patrick Gallagher, co-founder of CrunchFund, attended the Demo Day to support Kidaptive, which he invested in. Gallagher said he had not previously attended a StartX Demo Day, but was impressed by the companies that presented and appreciated that StartX had fewer presentations than some of the larger startup accelerators. StartX recently received $400,000 in additional funding from new partners and will be announcing another major partnership in the next week, according to founder Cameron Teitelman ‘10. Teitelman said that the StartX program has continually improved over time and said that he expected the trend to continue into the future.